House located on a farm dedicated primarily to corn and alfalfa which recently has appeared in the media for the great success of the "first corn maze " of Lleida. Two floors and a small wooden entrance, direct access to a hallway that leads us to distributor, to the right, the dining-room with fireplace type barbecue; beyond left hand and a bathroom; and at the end of the hallway a door to go into the garden, that is equipped with garden furniture ideal for enjoying the outdoors without being seen. Returning to the entrance we find the stairs leading to the second floor where there are two bedrooms, one double and one twin. Inside the room there is the second bathroom. You can expand capacity with three more places, in a room with two beds and the other two in the dining room (sofa bed). 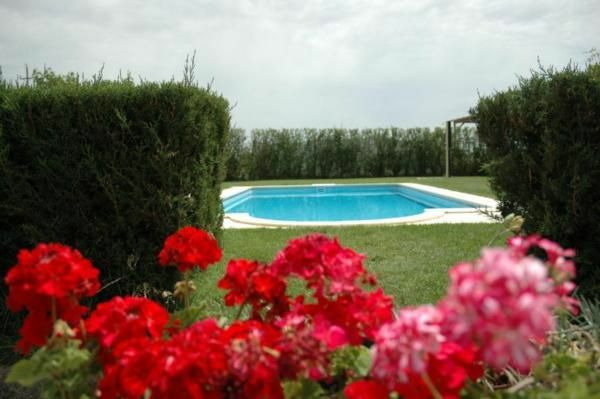 Shared with the owners of the house, this house has a large garden with pool and barbecue, with garden furniture. - Cot for adults: per object and day for rent at a price of 15.5 EUR (optional).